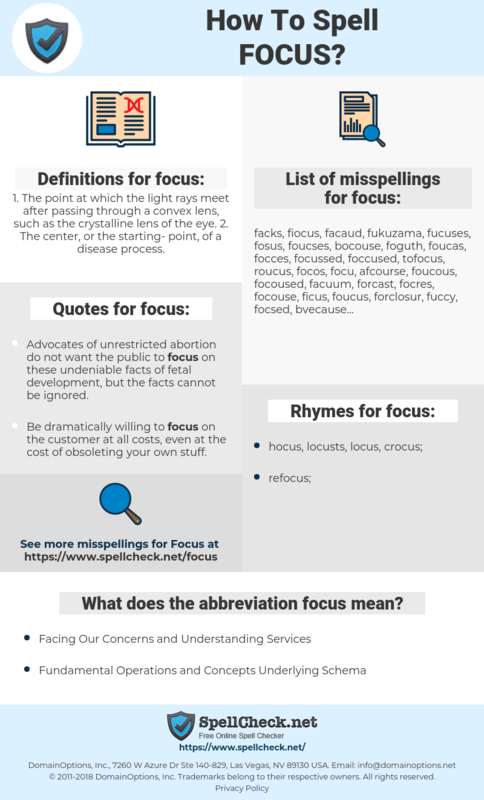 What are the misspellings for focus? What are the common mistypes for focus? What does the abbreviation focus mean? What are the quotes for focus? What are the rhymes for focus? What are the translations for focus? 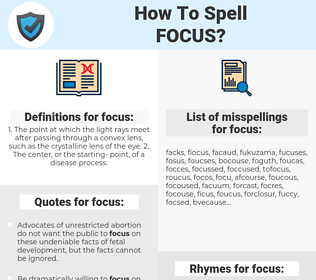 What are the common typos for focus? 1. The point at which the light rays meet after passing through a convex lens, such as the crystalline lens of the eye. 2. The center, or the starting-point, of a disease process. This graph shows how "focus" have occurred between 1800 and 2008 in a corpus of English books. Each feature I make is my focus at that time. middelpunt, nadruk, klemtoon, aandacht, focus, scherpstellen, opletten, scherpte, scherpstelling, zwaartepunt, brandpunt, aandachtspunt. Herd, Ausrichtung, Schwerpunkt, Fokus, Mittelpunkt, fokussieren, sammeln, richten, Orientierung, Konzentration, Hauptaugenmerk, Blickpunkt, Blickfeld, Brennpunkt, Bildschärfe, Brennfleck, bündeln, scharfstellen, ausleuchten, einleuchten. attenzione, fuoco, messa a fuoco, fulcro, interesse particolare. koncentrować się, skupiać się, skupiać, skupić się, ognisko. objectivo, ponto, destaque, ênfase, focar, focalizar, aposta, abordagem, focalização, prioridade. внимание, фокус, упор, нацеленность, средоточие, собранность. objetivo, tema, enfoque, foco, enfocar, centrar, concentrar, centro, prioridad, foco de atención, eje central.